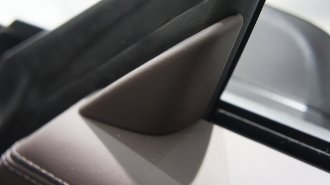 The Exclusive Option Leather Window Triangle Trims feature rich leather wrapped surfaces. These complete interior door trims are located at the base of the front windows and are an easy, DIY, snap-on installation that instantly adds a distinctive look to the standard door panels. Replacing the rough cheap looking plastic part with leather gives your Porsche a distinctive and exotic feel that you’ll appreciate every time you look out the side windows.